It’s common to need thin strips for edge banding or splines, but cutting these parts on the table saw can be dicey. In this WWGOA GOLD LIVE event, George Vondriska takes a look at two different approaches that make ripping thin pieces easy, and let you leave the guard on the saw. This WWGOA GOLD LIVE event is all about the fine art of turning a bowl using a four jaw chuck. George Vondriska explains the best way to set up your tool and demonstrates how to move your wood to create a perfectly round bowl. 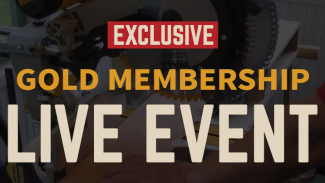 This WWGOA GOLD LIVE event is all about setting up your miter saw for accurate cuts. George Vondriska demonstrates the best way to prepare, make, and maintain consistently accurate with your miter saw (we know how important a perfect 90 degree angle can be). This WWGOA GOLD LIVE event is all about resawing on the band saw. George Vondriska shows you how to do it the right way and answers viewers questions about the process. In this WWGOA GOLD LIVE event, George Vondriska teaches you all about table saw set up, focusing on blade and fence parallelism.